Smeargle in game: 4,188 Who? Important notice! Pokemon Smeargle is a fictional character of humans. Smeargle is best known for its ability to use the move Sketch, which permanently copies the last move used by the opponent. Due to this, it can legitimately have any move in the Pokémon games except for Chatter and Struggle (not including Shadow moves). As a result of this, it can pass on any Egg Move to Pokémon in the Field Egg Group. 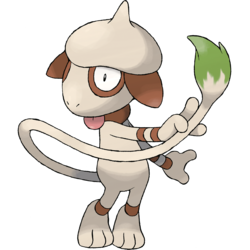 Smeargle is a beagle-like, bipedal Pokémon with white and brown fur. It has a long tail with an end resembling a paintbrush. 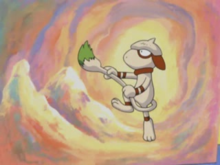 This paintbrush oozes with paint, and the color of the paint may vary for each Smeargle. Sprites from the games depict green, brown and red, while the anime also shows yellow and blue. Smeargle will use the paint to mark its territory. It can also use its signature move, Sketch, to copy moves from other Pokémon. Smeargle has a footprint on its back that is the same color as the tip of the tail. Smeargle also has a round structure on its head with a point that resembles a beret. It has floppy, brown ears and a brown collar on its neck. The rings encircling Smeargle's eyes are also brown, as are Smeargle's eyelids. Its arms have two brown bands, and its legs have only one. Each of its limbs have three digits. Smeargle is often found in urban areas. Smeargle first appeared in Pikachu & Pichu as part of the Pichu Brothers Posse. It also appeared in other episodes of the Pokémon Chronicles. In The Art Of Pokémon, a trio of Smeargle owned by Jack Pollockson were vandalizing the town of Whitestone. A Smeargle appeared under the ownership of Ogin in Giratina & The Sky Warrior. A Smeargle appeared in All Things Bright and Beautifly! under the ownership of a Pokémon Coordinator competing in the Rustboro Contest. 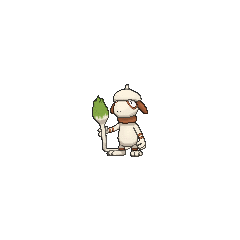 A Smeargle was used by one of the students of the Pokémon Trainer's School in Gonna Rule The School!. A Smeargle appeared in Till We Compete Again!, under the ownership of a Trainer. Two Trainers' Smeargle appeared in SM006. EP197 Smeargle Ash's Pokédex Smeargle, the Painter Pokémon. Colored fluids ooze from their tails which they use to mark their territory and to express themselves. Smeargle debuted in Murkrow Row where it was seen as one of the Pokémon in Joey's bag after Gold helped him get it back. Prior to Smeargle Smudge, Whitney gave her Smeargle nicknamed Smea-Smea, to DJ Mary, where it painted on Gold's face while he was sleep and battled against his Pokémon before running back to DJ Mary at the Goldenrod Radio Tower, which Gold eventually found it. In the HeartGold & SoulSilver chapter, Smea-Smea was returned to Whitney. 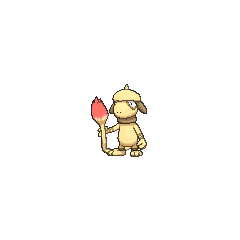 In The Last Battle XIII a Smeargle was one of the Pokémon sent to help the fight in Ilex Forest. In the Emerald chapter, a lot of Smeargle were found in Artisan Cave. Noland has three Smeargle which were caught in the Artisan Cave because they had copied Jirachi's Wish and he decided to use it to search for Jirachi. 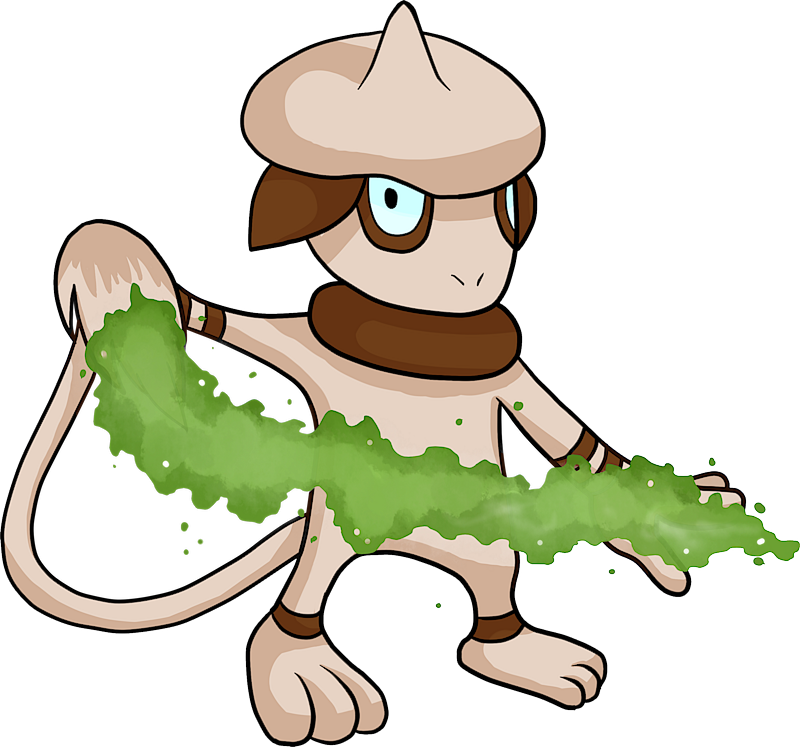 The unique composings produced by each Smeargle are painted using the fluid that oozes from its tail. This is how it marks its territory. Smeargle is the only Pokémon able to have both Outrage and Own Tempo, making it able to use the move without becoming confused. 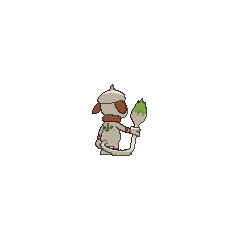 Smeargle is the only non-starter, non-event Pokémon able to legally know Frenzy Plant, Blast Burn, Hydro Cannon, Grass Pledge, Fire Pledge, or Water Pledge. Smeargle is the only Pokémon that can have these moves in different combinations of types. Smeargle can pass down any Egg Move combinations to any Pokémon in the Field Egg Group. This is important in Generations II to V, when only the father can pass down Egg Moves. Smeargle is able to Sketch Dark Void, but starting in Pokemon Sun and Moon, the move will always fail when used by Pokémon other than Darkrai. This is also the case In Pokémon Stadium 2, where they have also differently colored backs.